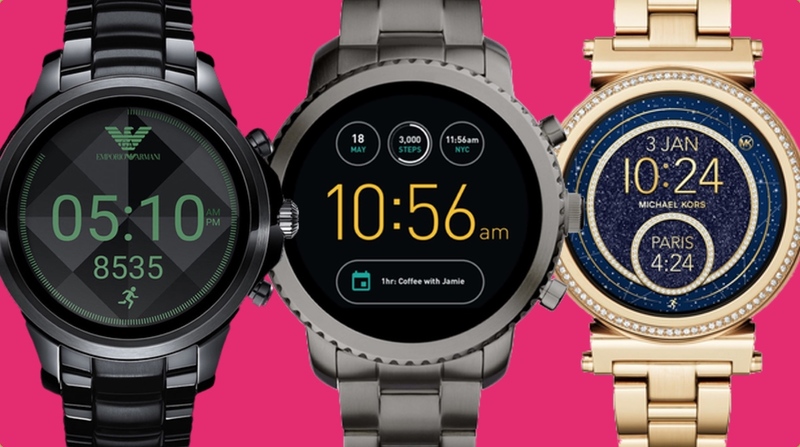 Just like last year, Fossil Group is once again spending 2017 launching scores of smartwatches from its bevy of fashion brands. Last year, the magic number was 100, and this year it's looking to launch 300 - that's right, 300 - different styles for your wrist. With Android Wear 2.0 arriving earlier this year, many new brands have also decided to embrace the full touchscreen look, as well as providing hybrid equivalents to their regular, dumb collections. Of course, it's nigh on impossible to offer a full review of each variation released under the Fossil umbrella over the course of this year, but let's take this opportunity to run through the releases company is overseeing in 2017. For men, the Fossil Q Explorist is a full-screen, 44mm-cased device packing Android Wear 2.0. And while this is still pretty chunky at 12mm, the lack of a flat tire and the bezel detail are nice touches here. Fossil has been pretty coy on screen resolution, but, like the rest of the touchscreen options we'll discuss below, we've found it to be an improvement on last year's options during our brief hands-ons. The Q Explorist comes in five colours, including stainless steel and rose gold stainless steel, but also comes with a smoke grey variant. Bands include navy and brown leathers and a smoke link bracelet. Like its male counterpart, the Q Venture also removes the flat tyre dead spot present in previous collections and improves upon the resolution of its predecessors. Naturally smaller, too, as a device made for women, the Q Venture will come in a 42mm case and with 11mm thickness, while also coming in eight colours. Looking to the hybrid collections, the Q Commuter brings a 40mm wide case and is 11mm thick. There are four basic versions: rose gold case with navy face; stainless steel case with navy face; stainless steel case with stainless steel face; and black case with a black face. Then you've got a choice of bands, including brown leather, stainless steel and navy. The Q Accomplice is a unisex hybrid coming in a 38mm, meaning it's a smaller option than much of the company's range. It's still relatively thick at 11mm, but you'll receive all the same hybrid smart features you get in the Commuter — notification alerts, step counting, music control, etc. There's a new Q Grant in town and, unlike the first, this hybrid device now sports just one sub-dial showing both the different modes and your goal percentage in one handy circle. Unfortunately, though, this is still one of the chunkier Fossil devices. Fossil announced too that its Q Modern Pursuit line is getting a connected extension. Like the Q Grant, there's a single sub-dial, while the hands have been finished with red tips for added visibility. Bringing a rugged edge to Android Wear, the Diesel On Full Guard comes in a range of finishes — gray, black, gold, black with silver lugs, and bands, black leather, brown leather, black metal band, gold metal band. It's all the same on the inside, though, with the Qualcomm 2100 Snapdragon processor running the show underneath a 48mm case also featuring IP67 water resistance and an AMOLED display. Easily one of the more stylish smartwatches in the Fossil Group range, the Emporio Armani Connected is another device set to sport a full touchscreen and run Android Wear. There's also a plethora of styles to choose from, including stainless steel colours and leather options. While its touchscreen models are the headliners here, Emporio Armani is still dabbling with hybrids, too. The range provides discreet notifications, activity tracking and will feature a slimmer form to the full-screen equivalents, while also coming in a number of different styles. It's not just Emporio getting in on the smartwatch action, with Armani Exchange also releasing a hybrid device to join the Fossil army. The watch, called the Armani Exchange Connected, sits at 44mm, offers water resistance to 5ATM and also runs for around six months on a coin cell battery. It also comes in four styles: black, white, blue, and an orange and black variant. Michael Kors, like Fossil itself, offers 2017 collections for both men and women without the dead screen spot which plagued last year's smartwatches. The Michael Kors Access Sofie is a more svelte offering than last year's Access Bradshaw option, with a pavé embellished bezel coming in silver, gold, rose gold and sable-tone finish. The Michael Kors Access Grayson, meanwhile, is a 47mm frame with a 1.39-inch screen. Both watches have matching specifications - Snapdragon 2100 under the hood, 4GB of storage, 512MB of RAM, and IP67 water resistance. Also on the Michael Kors watches will be a branded micro-app called My Social, allowing users hook up their Instagram account to customise watch faces with snaps from their feed. Neat. As for MK's hybrid offerings, a new range of styles and colours have been released for 2017: the women's Slim Runway collection and the men's Gage hybrids. The watches handle basic activity tracking, provide notification alerts and feature pusher buttons on the side which can take care of remote selfies and control music. Now sporting Android Wear, the Misfit Vapor comes with a 1.39-inch AMOLED display, 4GB of memory, and is water resistant to 50 meters. There's no GPS, but you'll still be able to make use of features such as the touch bezel, a heart rate monitor and Google Assistant. Unfortunately, unlike the rest of Fossil Group's options, Misfit only offers the device in two flavours, jet black and rose gold. Misfit is also bringing a hybrid to the scene, and the influence from Fossil is clear. The Misfit Command measures 44mm across and 15mm thick, helping it towards the more hefty end of the watch spectrum, while there are four variants - all stainless steel with a matte finish. All variations are water resistant to 50m, too, so you don't need to worry about getting it wet. While not yet on board with a touchscreen model, the Tory Burch Collins still packs in a number of smartwatch features, such as activity tracking and notification buzzes. As you might expect, this collection is all about the style, with four options available for punters to choose from. Representing the first piece of connected tech we've seen from Kate Spade is the Metro Grand, a device that's available in a bevy of different designs: rose gold casing with a thin, black watch face and black leather strap; gold casing with white watch face; gold casing with black watch face; silver model with a grey leather strap; and a gold casing with pale pink leather strap and white watch face. We also got the chance to see a slew of more Kate Spade hybrids at IFA 2017, but there are currently no details on when these will launch. We haven't heard much about the DKNY Minute hybrid since it was first announced back at Baselworld in March, but, as we can see from the solitary press shot released so far, it offers rose gold finish with a black watch face. A white DKNY logo, gold coloured watch hands and white indices also sit around the dial. Interchangeable straps will be available in black and red, both ribbed with matching rose gold finish buckle. Marc Jacobs is yet another fashion brand getting into wearable tech, initially with its Riley hybrid smartwatch. The connected device is based on the existing Marc Jacobs Riley collection, taking off the same round face oversized numbers on the watch face. The models we've seen so far have a white plastic body, strap and watch face with purple/black/metallic details, and a black plastic watch body and silicon strap with a green watch face and white/metallic pink/metallic purple details. The Skagen Jorn and Hald Connected are slimmer versions of last year's Skagen Hagen Connected, one of our favorite hybrid smartwatches of 2016. Now back for a second act, the company hasn't gone for a huge overhaul but instead made a few tweaks that refine the analogue smartwatch. The Signatur Hybrid is available in four 42mm styles for men — silver steel mesh, brown leather with a black dial, olive leather with a grey dial, and black leather with a white dial — with users able to customise the three buttons on the side of the watch to gain control of their smartphone.